Ethnicity: 95% of the population is Malay. The Chinese, representing approximately 2% of the population, are the largest minority group. Religion: Catholicism is the predominant religion in the Philippines, counting roughly 80% of the population as adherents. The remainder of the population is divided amongst Islam, Protestant Christianity and other sects and religions. Islam is especially prevalent in the Mindanao region. Languages: Filipino and English are the 2 official languages of the Philippines. English is the language of instruction in most subjects in all levels of education. Over 100 regional languages are also spoken in the Philippines. Founding Date: The Philippines was under Spanish control for over 3 centuries, followed by roughly 50 years of American dominion. The independent Republic of the Philippines was officially inaugurated on July 4, 1946. Administration: The country follows a democratic system of government. The Philippines is subdivided into 17 administrative regions. Since the 1940s, the Philippines has followed a 10 year system of school education, consisting of 6 years of primary school and 4 years of secondary school. The total yearly hours of instruction in the Philippines is relatively high when compared to other countries. Upon successful completion of secondary school, students receive a school-issued Diploma (Katibayan) or Certificate of Graduation (Katunayan) issued by the Department of Education. The completion of secondary school gives access to university study. Higher education in the Philippines has been heavily influenced by the American system and typically follows a 3-tier degree structure – bachelor’s, master’s and doctoral-level studies; however an associate degree may be awarded as a first degree. Certificate and diploma programs are also offered at both the undergraduate and graduate levels. Associate degrees typically involve 2 years of study, although some may take 3 years. Bachelor’s degrees are the most common first degree awarded. General bachelor’s degrees involve 4 years of full-time study. Bachelor’s degrees in specialized and professional fields such as engineering require 5 years; first professional degrees in dentistry, optometry and veterinary medicine typically require 6 years; and degrees in medicine and law may require up to 8 years. Master’s degrees, which may be either research-based or professional, require 2 years of full-time study beyond the bachelor’s degree. Many graduate students attend part-time, and must complete their degrees within 5 years. Doctoral degrees (PhD), which may also be either research-based or professional, normally require 5 years of study after the master’s degree; however a minimum of 3 years up to a maximum of 8 years of study is required. Credentials obtained through technical / vocational education programs are identified by a variety of titles chosen by the institution or program, including diploma, associate, graduate or certificate. The duration of these programs varies – they can be as short as 30 hours or up to 3 years in length. Students who have completed the appropriate qualification requirements may sit the National Certificate examinations. 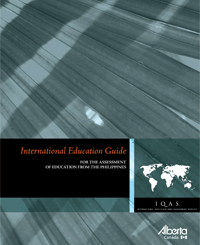 In the Philippines, private higher education institutions are the most common. Although public schools represent only 10% of the total number of institutions, they enrol almost a third of all students pursing higher education. Since 1994, the Commission on Higher Education (CHED) has administered and supervised all tertiary-level, degree-granting institutions in both the private and public sectors. CHED provides a Directory of Higher Education Institutions. The Technical Education and Skills Development Authority (TESDA) approves individual technical and vocational education programs, rather than institutions. TESDA maintains a list of approved programs on its website. Katibayan or Katunayan (sekundarya) (High School Diploma) Completion of Elementary School (6 or 7 years) 4 years Generally compares to the completion of Grade 11. Sertipiko or Diploma (Certificate or Diploma (1-year post-secondary program)) High School Diploma (10 years) 1 year The combination of the High School Diploma and a one-year Certificate or Diploma generally compares to the completion of a High School Diploma, including vocational / or technical / or professional training. Sertipiko or Diploma (Certificate or Diploma (2-year post-secondary program)) High School Diploma (10 years) 2 years The combination of the High School Diploma and a two-year Certificate or Diploma generally compares to the completion of a one-year post-secondary Certificate. Sertipiko or Diploma (Certificate or Diploma (3-year post-secondary program)) High School Diploma (10 years) 3 years The combination of the High School Diploma and a three-year Certificate or Diploma generally compares to the completion of a two-year post-secondary Diploma. Asoyado (Associate’s degree (2-year program)) High School Diploma (10 years) 2 years Generally compares to the completion of a one-year post-secondary Certificate. Asoyado (Associate’s degree (3-year program)) High School Diploma (10 years) 3 years Generally compares to the completion of a two-year post-secondary Diploma. Batsilyer (Bachelor’s degree) High School Diploma (10 years) 4 years Generally compares to the completion of a three-year Bachelor’s degree. Batsilyer (Teraping Okupasyonal / Terapiya Pisikal) (Bachelor’s degree (Occupational Therapy / Physical Therapy)) High School Diploma (10 years) 5 years, including 1 year of internship Generally compares to the completion of a four-year Bachelor’s degree. Batsilyer (Inhenyeriya / Arkitektura) (Bachelor’s degree (Engineering / Architecture)) High School Diploma (10 years) 5 years Generally compares to the completion of a four-year Bachelor’s degree. Doktor ng Medisina (Doctor of Medicine) High School Diploma (10 years) 6 years (minimum) Generally compares to the completion of a first professional university degree in medicine. Doktor ng Medisinang Dental (Doctor of Dental Medicine) High School Diploma (10 years) 6 years (minimum) Generally compares to the completion of a first professional university degree in dentistry. Doktor ng Optomitrya (Doctor of Optometry) High School Diploma (10 years) 6 years (minimum) Generally compares to the completion of a first professional university degree in optometry. Doktor ng Panggagamot sa Hayop (Doctor of Veterinary Medicine) High School Diploma (10 years) 6 years (minimum) Generally compares to the completion of a first professional university degree in veterinary. Batsilyer sa Pambabatas (LLB) or Batsilyer sa Batas (Bachelor of Laws, Juris Doctor) High School Diploma (10 years) 6 years (minimum) Generally compares to the completion of a first professional university degree in law. Postgradweyt Sertipiko or Diploma (Postgraduate Certificate or Diploma) Bachelor’s degree 0.5 year to 2 years Assessed individually depending upon duration and the type of courses taken. Masterado, Dalubhasa, Kadalubhasan (Master’s degree) Bachelor’s degree 2 years Generally compares to the completion of a one-year Master’s degree. Doktor sa Pilosopiya (Doctor of Philosophy degree) Master’s degree 3 years Generally compares to the completion of a Doctor of Philosophy (PhD) degree. These templates give detailed information on educational credentials awarded for programs of study completed in the Republic of Philippines.